For a casual chic look, try pairing a green trenchcoat with blue dress pants — these two pieces the place of work beautifully together. As for the shoes, go for a pair of blue leather pumps. If you're after a casual yet absolutely chic ensemble, opt for a tiko paksa classic belted trench coat and navy jeans. Both items are totally comfy and will look fabulous together. Take your look into a sportier direction with black leather ballerina shoes. 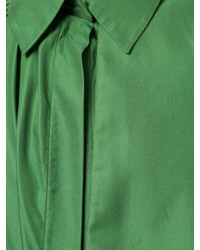 If you're after a casual yet totally chic ensemble, pair a green trenchcoat with light blue skinny jeans. Both garments are totally comfy and will look fabulous together. For something more on the daring side to complement this outfit, make black and white high top sneakers your footwear choice. 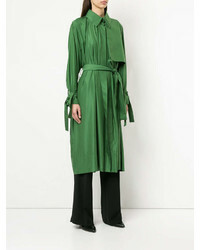 If you're hunting for a casual yet stylish look, consider pairing a tiko paksa classic belted trench coat from farfetch.com with charcoal jeans. Both pieces are totally comfy and will look fabulous paired together. Finish off with black leather ankle boots and off you go looking gorgeous. For a killer-meets-stylish look, consider pairing a tiko paksa classic belted trench coat with a navy and white floral pencil skirt — these two items fit nicely together. Black leather pumps work wonderfully well with this look.